Sorry I am a bit absent at the moment from 365, but there is so much going on here right now and not enough hours in the day. I will catch up as often as I can. Perhaps today wasn't the best day to go out with my crystal ball because, although it is autumn here now, the temperature was 32 degrees c today. I didn't manage to set fire to the log that the ball is resting on though so all was good. I love this Babs - especially the way there are trees in the ball but none outside it. Beautiful focus. It looks like a hand is holding the ball in its grasp. A wonderful view of the upside down world ! LOL I'm glad to hear that you didn't burn down the log!!! Need to be careful! Fav for a totally beautiful shot, Babs. I keep promising myself a crystal ball but never get round to it. I love this Babs! What a great scene and that old stump is fabulous. Big Fav!! Beautiful capture and scene. Great focus too. Love it, and what a super composition. That’s a very clever shot. I love it. Oh I love your crystal ball shots.................I have to give it a try again, I'm never very successful! Excellent use of a crystal! FAV! Great scene and view. Beautiful done and captured. Fav. Beautifully captured and balanced image! Great composition and colors! Super shot Babs. Hope all is well with you and David. Such a good image in the crystal ball, and I love that you used the natural wood for the stand. @lindasees @julzmaioro @Dawn @brennieb @ludwigsdiana @annied @maggiemae @lyndamcg @sdutoit @jacqbb @robz @gilbertwood @365projectorgjenfurj @777margo @30pics4jackiesdiamond @beryl @pcoulson @inthecloud5 @bella_ss @sangwann @busylady @louannwarren @novab @fbailey @merrelyn @susiemc @mittens @radiogirl @taffy @peterday @angelar @carolmw @tonygig @kwind @snowy @pyrrhula @samae @wyomingsis @taffy @chejja @bkbinthecity Thanks so much for putting this shot on the TP and the PP. Good job I didn't go out today with the ball or I could have set fire to something it has been even hotter today, about 36 degrees C I believe. I think there is a cool change and some rain on its way though which will be a relief. @golftragic All good Marnie, will email you soon. Don't tell anyone but I think I have a whole day at home tomorrow. @gigiflower I was relieved I didn't set fire to the log too Sam, I was keeping an eye on it. @quietpurplehaze Do get a ball Hazel, they are great fun. Great shot. I love how it is set in the bark. 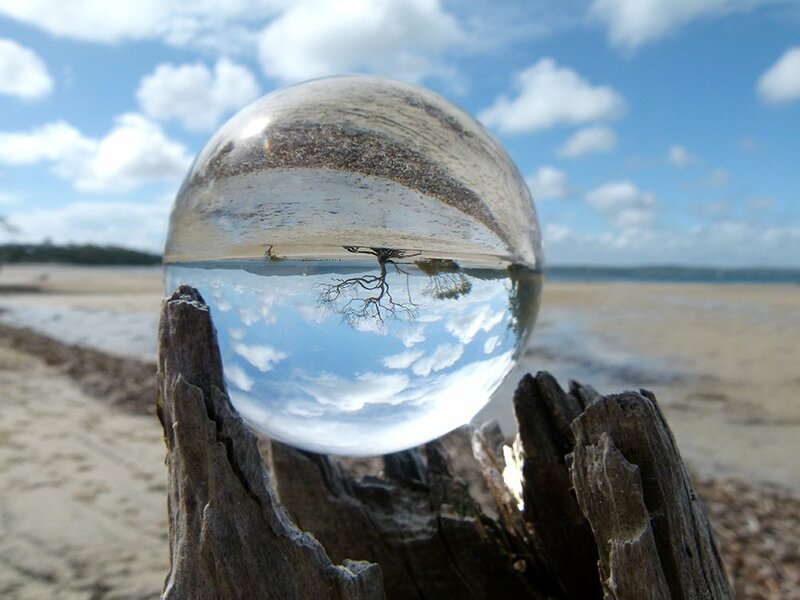 Beautiful crystal ball shot! Had to laugh about setting the wood on fire as I burned myself once trying to get a shot of a barn in the crystal ball- ouch! pretty cool - you put that crystal ball to great use here. Great to see this on TT as it was so inspiring to me!